Do you guys remember the bed I got on Overstock for my STILL in progress bedroom? Here is the room again, but still unpainted. I have to find time to do that – it’s the only thing left, but it is so time consuming…. So the bed is obviously the star of the show. It is by the company Inspire Q, which sells through Overstock. I remember telling you guys when I first showed these photos, but I will tell you again, that it is one of the better pieces of furniture that I have in my house. It is SO gorgeous and SO well made. I think I may have written this before too – one day I walked into the bedroom to see Ellie hanging from the front crossbar. After almost having a heart attack, I went over to the bed, assuming she had hurt it or broken it. But nope – her 90 pounds didn’t do anything to the frame. 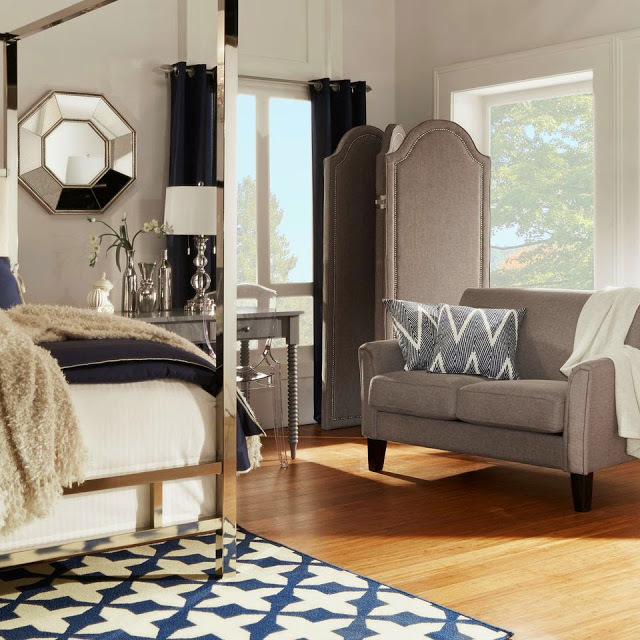 This bed is really, really sturdy and well-made, and looks exactly the same as the one sold at Neiman Marcus and other stores for 3 to 4 times the cost. I couldn’t love it more, and can’t find any words to tell you how pleased I am with the quality and style. I highly, highly recommend it. Oh, and the price – it is a GREAT price and one of the better deals I have scored. And although I haven’t had occasion to buy other items from inspire Q, I have absolutely no hesitation or reservation about doing so in the future. So anyway, when I initially posted about my room, I linked to the bed on Overstock. I think that is how Inspire Q must have found me, and I am so glad they did! They asked me recently to design a room from their line of products at Overstock. 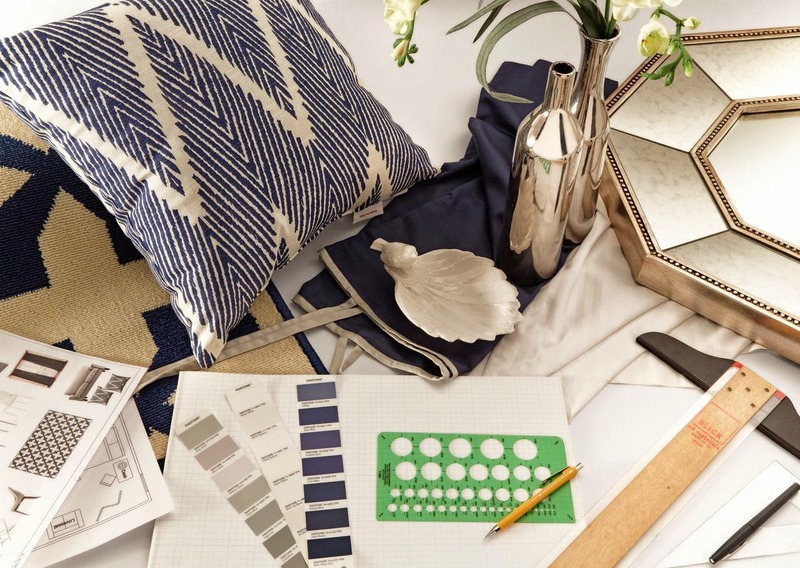 After doing a mood board, they actually got all of the items together and built and photographed the room. Isn’t that amazing? I’m going to show it to you below, and then after that you can enter to win the bed or other items from the room. I didn’t find out what the giveaway items would be until a few days ago, and I was blown away by the company’s generosity. Thank you thank you thank you so much inspire Q for this giveaway. Okay here is the room I designed…. What do you think? I hope you like it. When my husband saw the photos he said “It looks like our room.” Well, duh. That makes sense since I designed them both! I guess my style is pretty set in stone, and these items are exact fits for me. Next, you can enter to win the bed or one of the other items below…. Giveaway runs from now until 11:59:59 on May 4th. On May 5th, the random winner will be selected by Rafflecopter. Winner will be contacted by email. Winner may select one item from the list above, and it will be shipped to winner directly from the company. And most of all, thank you SO MUCH Inspire Q! WOW!!! The bedroom they designed is amazing, LOVE it. And what a generous giveaway….who wouldn't love to win that gorgeous bed! Wow…it does look like yours…great give away! Stacey your giveaway is awesome. Thank you for organizing this for your subscribers. Is the contest open to your Canadian subscribers? I believe the giveaway is open to people with US delivery addresses only, but I will check with the sponsor – thank you! the room you designed is a peaceful haven. I keep staring at it and thinking can I ever have a bedroom this gorgeous? I love it. The bedroom you designed is just amazing. I love everything about it. And, yes I'd love to have that bed! What an incredible give-away! WoW! What an ah-mazing giveaway. The bed is simply gorgeous! Thank you for this opportunity!! Stacey this is an incredible giveaway! !The room you designed is gorgeous beyond! !How generous of Overstock and Inspire Q! Such a beautiful room, Stacy, and what an exciting experience!!! Love these pieces and glad to know about Inspire Q now. the last question on the rafflecoptor is not working. It does not have a valid pin and will not let you put in a pin address if you find, repin and copy on pinterest. The room you designed is beautiful and the prizes are amazing. I couldn't pin an image either. Wow, that bed is fabulous! I would never have know about it if you hadn't posted about this company. Would love to win it for my guest room. I am going to check out what else they sell.